As you may have heard, I'm playing around with Patreon. In fact, what I'm playing around with is giving my patrons more value for their patronage. 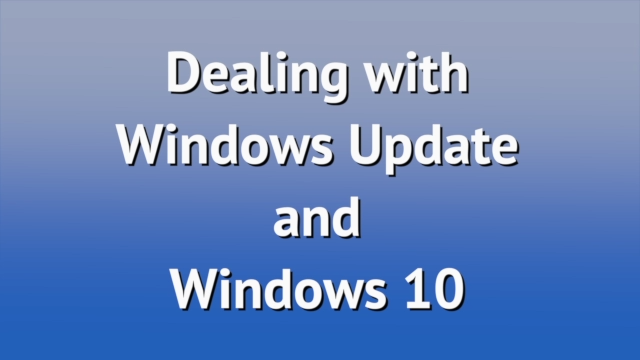 These are short, hopefully useful tips about Windows, technology, and whatever else comes to mind. My first couple of weeks efforts have centered on travel (while I was on the road), Skype, the Windows 10 start menu and more. I'm also working on an archive so that all tips will be visible to all patrons regardless of when you sign up. And, yes, I'm working on that "It's a secret" level of patronage as well. I really think you'll like that one when it's ready. Stay tuned! Keeping your machine as up-to-date as possible is critically important to keeping it, and yourself. safe and secure from discovered vulnerabilities. Yet, with Windows 10 of late, there seems to be risk in taking those updates as well. I'll review my strategy to stay both functional and safe. Let's look at some of the reasons, and the implication of each on what's more formally called "data retention". Continue Reading: How Long Should I Keep My Backups? Windows 10 wants me to use a "Microsoft account". I've had a Hotmail account for years, is that the same? Different? Do I need to create yet another account to keep track of? Many people are confused by the concept of a "Microsoft account". Microsoft introduced it around the time of Windows 8; with the arrival of Windows 10, they're pushing the concept even harder. I've long held that Microsoft just doesn't do product names well, but in this case, they had no choice. They needed a term for a more general concept. Your Hotmail account already is a Microsoft account – as are many, many other accounts. That's where people are getting confused. Continue Reading: What Is a "Microsoft Account"? I use Outlook.com. Does that mean I don't need Outlook? Are those just other names for the same thing? If not, how do they relate to each other? The short answer is, they don't. Not at all. They have only two things in common: they're both related to email, and have the word "Outlook" in their names. That's pretty much where the similarity ends. It's frustrating, because people often refer to "Outlook" when they mean "Outlook.com" … which is not actually related to "Outlook". Let's define 'em, shall we? Continue Reading: How Do Outlook and Outlook.com Relate? Online Shopping - Just How Safe Is It? What's the Difference Between "Image" and "Clone"? I've been using Macrium Reflect, with which I make images and clone my main drive to an extra internal drive. In a pinch, I've found it much easier to simply switch to my cloned drive, and I'm immediately off and running again! I update my cloned drive as I do my work, so it's always up to date, and once a month re-clone in order to get all my Windows updates on the cloned drive. I also do a complete Macrium image every 2 weeks to cover my bases. Thank you, Leo. This is a very puzzling question I have been asking myself for years, and never found the answer to. (Years of using the paid version of Macrium Reflect, and reading their manuals and forum, I may add...) Thanks also to the commenters who explained how they use cloning to be sure their backup is working. That was certainly illuminating. By the way, making sure your system disk backup will work if you need it is one of the most irritating (and overlooked) problems... You once wrote an article on the subject, and if I remember correctly, your conclusion was that there was almost no way to simulate fully a restore operation for verification purposes... Hence the point of cloning. Please correct me if I'm wrong. It's not "the point" of cloning at all. Cloning serves certain purposes, but imaging it perfectly valid for 90% of most users. You can't "test" a clone without taking it live, which, depending on your technique, may have the same issues as testing an image. "Never underestimate the bandwidth of a station wagon full of tapes hurtling down the highway. "-Andrew S. Tanenbaum, Computer Networks, 4th ed., p. 91.
sneakernet n. Term used (generally with ironic intent) for transfer of electronic information by physically carrying tape, disks, or some other media from one machine to another. "Never underestimate the bandwidth of a station wagon filled with magtape, or a 747 filled with CD-ROMs." Also called 'Tennis-Net', 'Armpit-Net', 'Floppy-Net', or 'Shoenet'. E. S. Raymond, Ed., The New Hacker's Dictionary, 3rd ed. , Cambridge, MA: The MIT Press, 1996. I occasionally do the math ... for example what's the effective bandwidth of the Netflix delivery service? (How fast is Netflix? No, not streaming, I mean the DVD service.). For large volumes of data there's still no substitute for a hard drive packed with information flying down the freeway. In fact many cloud storage providers even have specific services where you can ship them a drive to pre-populate your cloud storage.